The Martin MC Switch lets you power up and down 6 fixtures such as lights or mirror balls, with the option of daisy chaining up to 24 units through four power boxes. 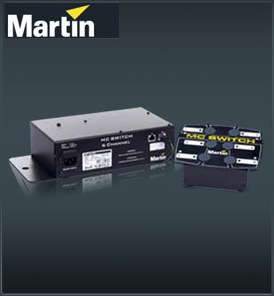 The Martin MC Switch control box connects to a power box which has six IEC channels out via RJ 45 cable - allowing a maximum of 300W output for each. (US version maximum output: 250W per output/fixture). The MC switch controls lights such as the Mania, egos, T-Rex, Raptor and fixtures like mirror balls. The control is a mains power on/off digital switch which is controlled via a remote control with on/off buttons.